We identified eleven medications that significantly reduced emergency hospital admissions, were supported by high or moderate quality evidence, and were endorsed in clinical guidelines. Emergency hospital admissions are rising and, increasingly, policy-makers, clinicians, and patients are worried about their effect on cancellations of elective procedures, prolonged waiting times, in-hospital infection rates, and costs. However, identifying useful strategies for reducing admissions has proved problematic; interventions designed to reduce hospitalisations often achieve no real-world benefit, yet consume scarce health resources. One promising intervention that has received little attention is medications; those which help a patient to avoid hospitalisation represent high-value activity in a patient’s overall care. Medications can reduce admission rates by preventing illnesses or mitigating symptoms and exacerbations that would have otherwise required urgent health care. Our new study in BMC Medicine, therefore, aimed to identify and prioritise medications that have been shown in systematic reviews to prevent patients from requiring emergency hospital care. We searched for systematic reviews of randomised controlled trials in adults that reported hospital admissions as an outcome. We then assessed the quality of evidence using GRADE criteria. We cross referenced effective medications with high or moderate quality evidence with UK, USA, and European clinical guidelines to determine which had an acceptable overall balance of benefit to harm. We found 140 systematic reviews, including 1,968 randomised controlled trials and 925,364 patients. 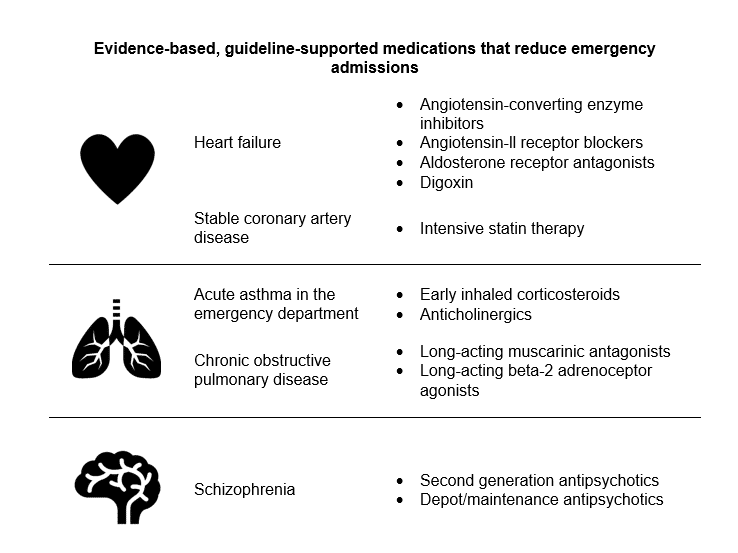 We identified eleven medications that significantly reduced emergency hospital admissions, were supported by high or moderate quality evidence, and were endorsed in clinical guidelines. Using the eleven medications that we identified is clinically appropriate and will significantly reduce emergency hospital admissions for patients with heart failure, coronary artery disease, asthma, chronic obstructive pulmonary disease, and schizophrenia. In some health systems, these medications are already prescribed as part of routine clinical practice. However, there is evidence of significant variation in their use in the UK, USA, and Europe, including under-prescribing and under-dosing. Therefore, policy-makers and clinicians should consider monitoring and improving use of these medications as a strategy to alleviate pressures on secondary acute care. Existing mechanisms for quality measurement and improvement could be utilised. For example, the UK Quality and Outcomes Framework is a pay for performance incentive program that has reduced prescribing gaps and improved prescribing efficiency. The medications we identified should be considered for inclusion in these types of quality assurance and incentive systems. Our results may also be used to inform shared decision making. When communicating treatment options with eligible patients, clinicians could discuss the ability of these medications to reduce the risk of being hospitalised. Given that most patients prefer to stay out of hospitals, we hope that our findings will help to inform their decisions. This blog first appeared in BMC Medicine. Niklas Bobrovitz is a PhD candidate in the Nuffield Department of Primary Care Health Sciences at the University of Oxford. He is also an honorary fellow at the Oxford Centre for Evidence-Based Medicine. His research focuses on health care utilisation, quality of care, and improving the translation of evidence into practice. He can be contacted on twitter (@nikbobrovitz) or by email (niklas.bobrovitz@phc.ox.ac.uk). 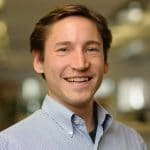 Acknowledgments: Niklas Bobrovitz was funded by a Clarendon Scholarship, a Goodger and Schorstein Medical Sciences Research Scholarship, and the National Institute for Health Research School for Primary Care Research.